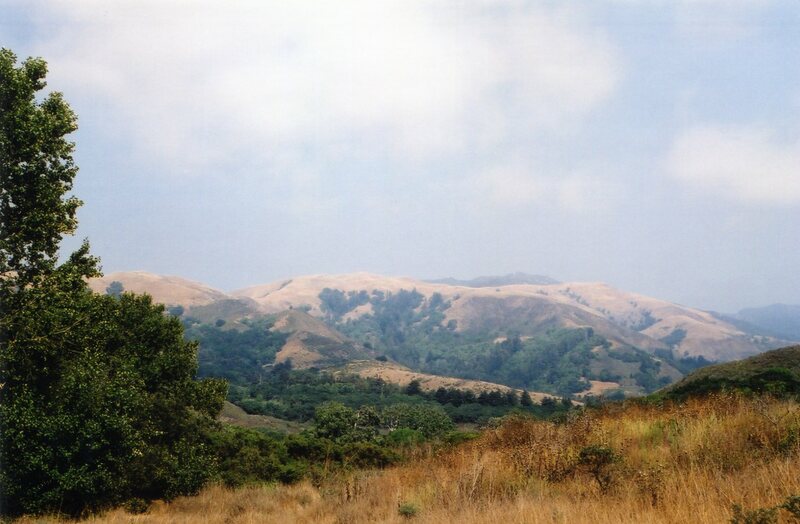 The Salinas Valley stretches from Obispo to San Francisco. John Steinbeck, himself born in Salinas, sat down to write this great epic story in 1951. It is about good and evil, jealousy or the feeling of being rejected, redemption, about the battling conflict between the desire to submit to God and tradition and the human need of selfrealization and above all about TIMSHEL. This may be the most important word in the world. 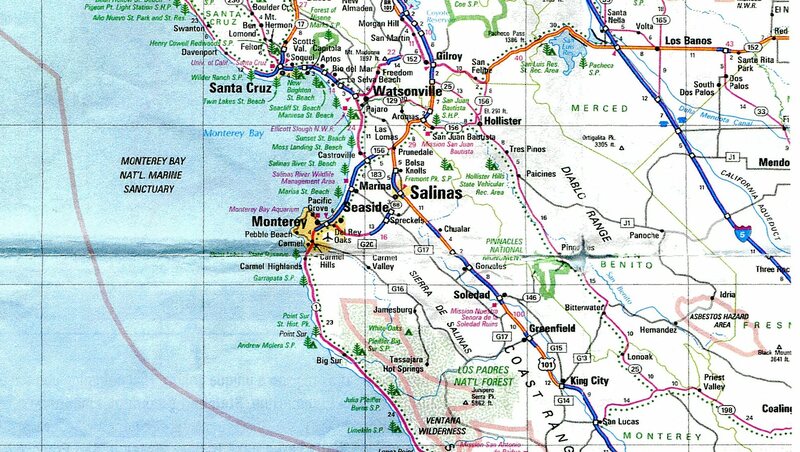 In this story the lives of two families, living in the Salinas Valey, California, are intertwined and it spans three generations. The book has 602 pages (there are certainly abridged editions) and some of you may remember the film with James Dean as Cal, the only surviving son of the Trask’s. To summarize this book would be a very big undertaking and I have therefore decided to write down some quotations and from the book which seem to me very impressive touching and exhilarating and some explanations in reference. 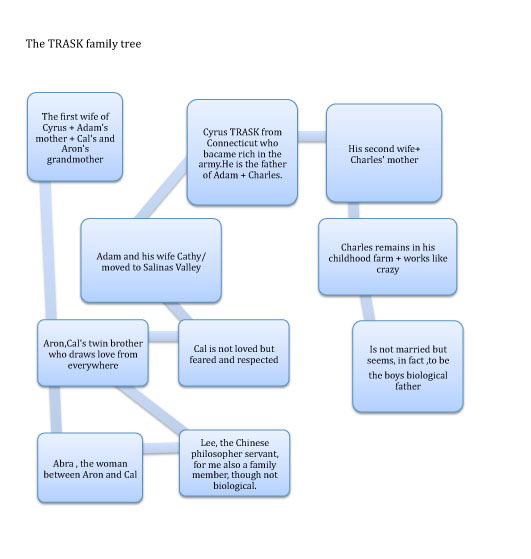 To begin with there is a family tree of the Task’s. The other family involved is the Hamiltons. Samuel is a very special person who manages to rise a big family on an unyielding plot of land and and his very religous wife. They had immigrated from Ireland. The following one is by Lee, Mr. Trask’s Chinese philosopher servant who brought up the twins after their mother had just left them with the father, who she had also shot at and who was unable to come to grips with the situation. Lee, in fact, took care of quite everything in that household and what Steinbeck makes him say in this book has given goose pimples to me. The Americans look down on servants and above all Chinese servants and Lee explains to Samuel why he is content to be one. „But the Hebrew word, the word timshel—‘Thou mayest’— that gives a choice. It might be the most important word in the world. That says the way is open. That throws it right back on a man. For if ‘Thou mayest’—it is also true that ‘Thou mayest not.” (Page 305) These words mean that the human being has a choice and he success or defeat in life does not depend on theblood within himself !! Lee admits that these studies have not bent him towards God but he discovered a new love for the glittering instrument, the human soul. Timshel will in the end give hope to Cal and he doesn’t have to be like his mother. I hope this is not a new thought to you! Anyway, even Confucius, who lived approx. 5oo years B.C. told people how to live in order to be successful! In the last conversation betwen Kate and Adam, she calls Adam Mr. Mouse and is expecting his sermon. I hope very much that you feel now like reading this outstanding novel! Here is a video link to the episode where Cal tells his father that he knows about the mother and what she does and that he, Adam, had never loved them. Here you can see Cal meeting his mother.